Five years ago we were talking about the Kayanernh-Kowa Lodge #219 S17 flap celebrating the 50th Anniversary of Sabbittis. This is one of two issues celebrating the event. The other version can be found here. 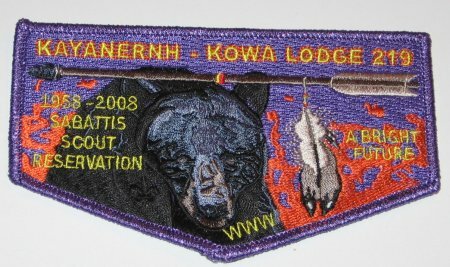 With the upcoming Central New York Trade-O-Ree being held at Camp Woodlands next weekend, we are looking back at the Kayanernh-Kowa Lodge #219 S17 50th Anniversary Sabbittis on one of their other Council Camps from June 2009. Will have to see what I can acquire at the the upcoming Central New York Trade-O-Ree being held at Camp Woodlands next weekend. It is the season for Winter Banquets, hopefully we will have some new issues to report here. 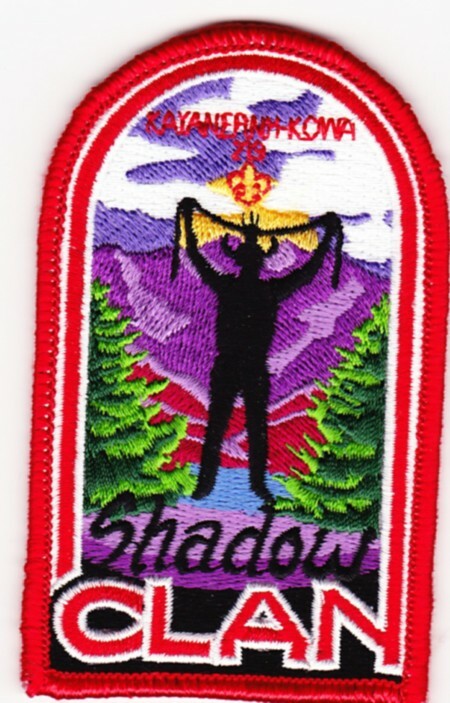 Obne we reported on 6 years ago was the Kayanernh-Kowa Lodge #219 2008 Winter Banquet Patch. Attended the 2008 #219 Banquet last night (1/12/08). Issued one event patch ….they were 1/attendee there were a few leftover). 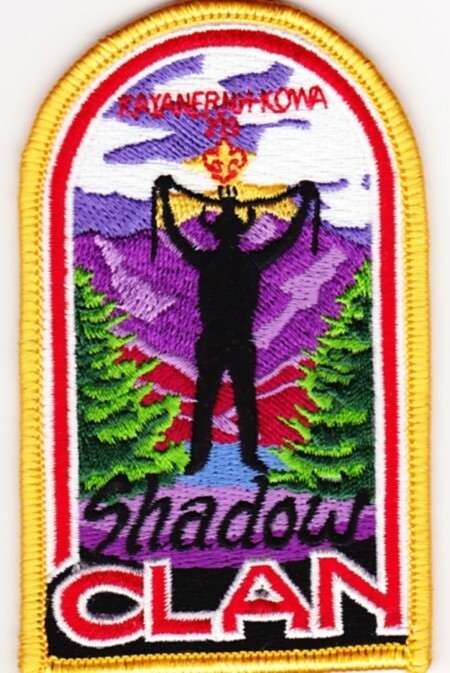 Patch features an Abominable Snowman eating a drumstick with bloody teeth forming the WWW (lodge thought they’d have a little fun with this). I believe it’ll be labeled the eX2008-1 (I’m not aware of any other issues in prior 11 days. Has your New York Lodge issued any recent items which can be posted here? Email me at nyoatrader at nyoatrader dot com. 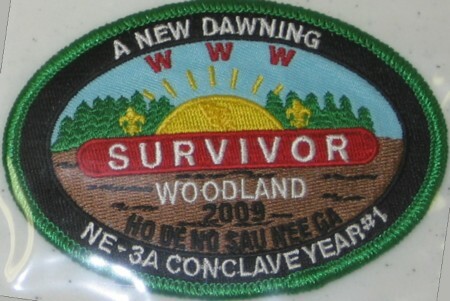 I had previously written about the first Section NE-3A Conclave held in 2009, was hosted by Kayanernh-Kowa Lodge #219 and held at their Camp Woodlands. 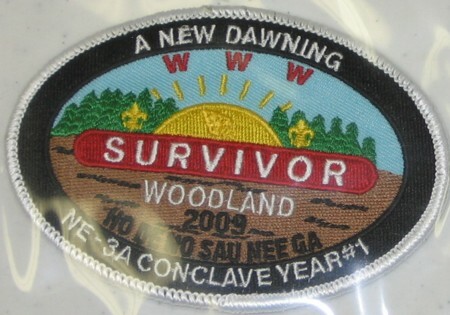 The two patch issues used the Survivor motif. I became aware of two additional patches issued for the event, one of which I was able to pick up at the Empire State TOR last weekend. First was what I believe was the Staff issue. 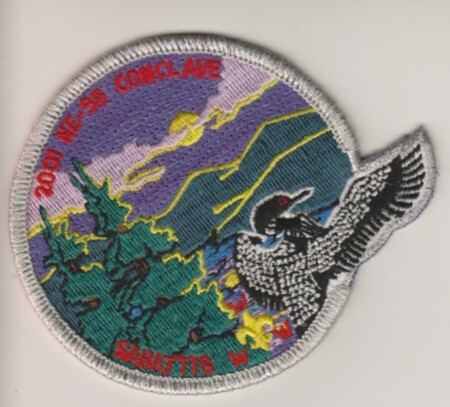 I had previously written about the 2001 Section NE-3B Conclave which was held at Sabbattis Scout Reservation and hosted by Kayanernh-Kowa Lodge #219. I recently came across what I believe is a staff issue from the event. The design is the same as the white bordered patch, but this one has a silver Mylar border. When earned for the fourth year a yellow bordered version is awarded. Once the sequence is completed, the first version is repeated. You can find links to the earlier posts in the series through the links below.